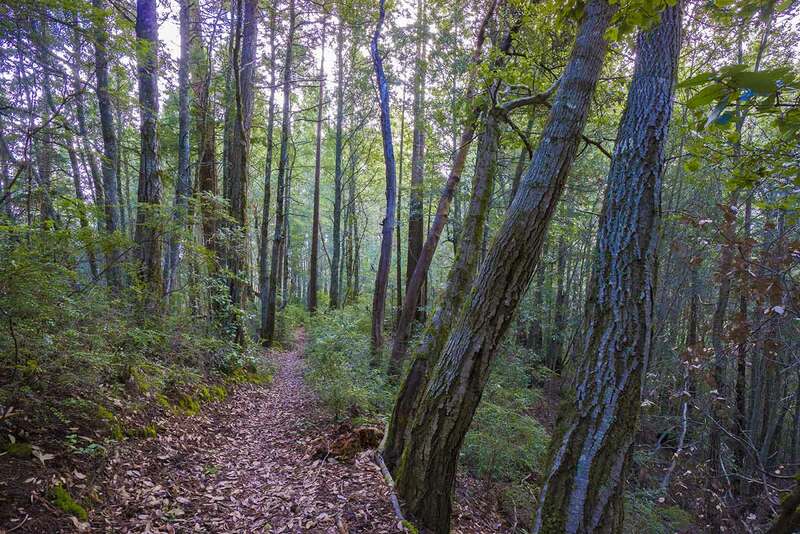 The quiet, remote Butano Ridge loop has a minimum of distractions: there aren’t a lot of trail intersections or signs of development, there’s hardly anyone else on the trail, and the trails are very well maintained and easy to hike. 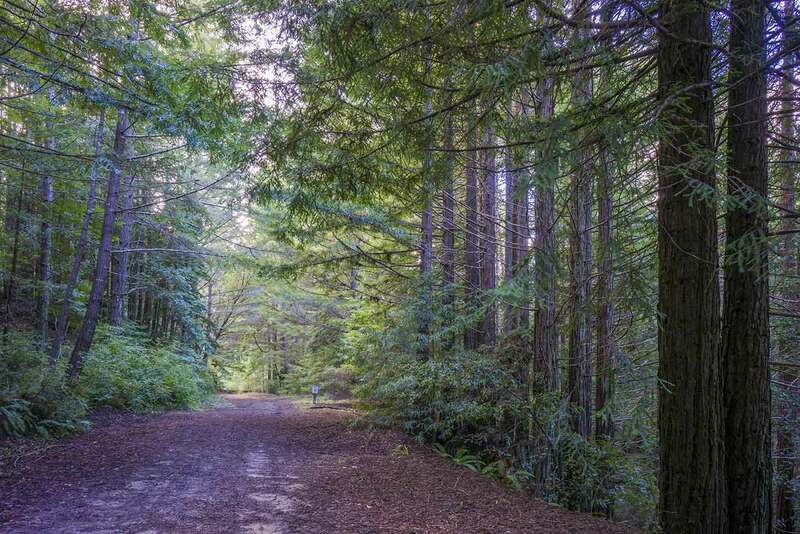 The route, which is on old logging roads and singletrack trails, is entirely wooded with attractive second-growth redwood forest, so it doesn’t get too hot in the summer or muddy in the winter. And although it’s a long hike with a lot of elevation gain, because of the flat logging roads at the beginning and end it’s surprisingly fast. 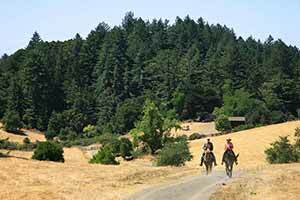 Because the area is so little developed, and because of the way Butano Ridge is isolated from other nearby ridges, the route feels much different from all the other trails in the Pescadero Creek area. 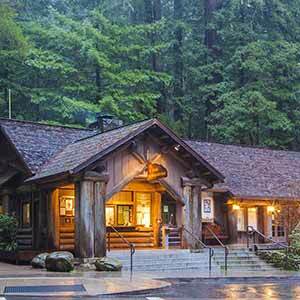 It doesn’t have any sort of destination — there aren’t any scenic viewpoints, or big trees, or waterfalls — so if you’re not a hard-core hiker it might seem a little dull. 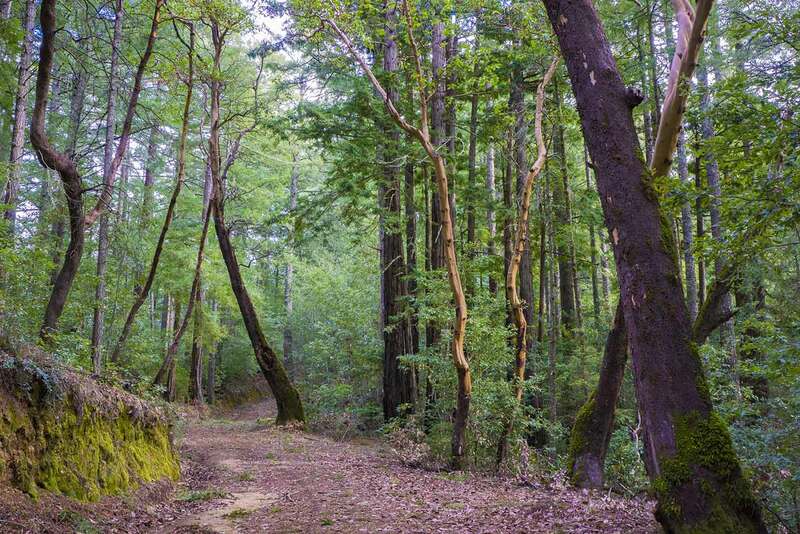 Nonetheless, this is a quintessentital Santa Cruz Mountains hike. 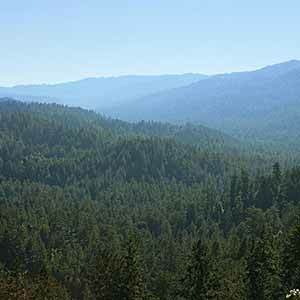 Butano Ridge’s remoteness, easy-to-hike roads, and attractive woods are a lot like various logging road hikes on the North Coast, like the Mill Creek Watershed, Orick Horse Trails, and the Humboldt Redwoods backcountry. 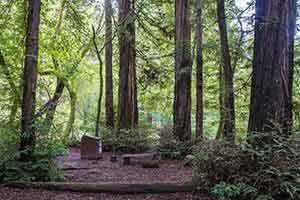 Start at the Hoffman Creek Trailhead, where there’s no parking fee. 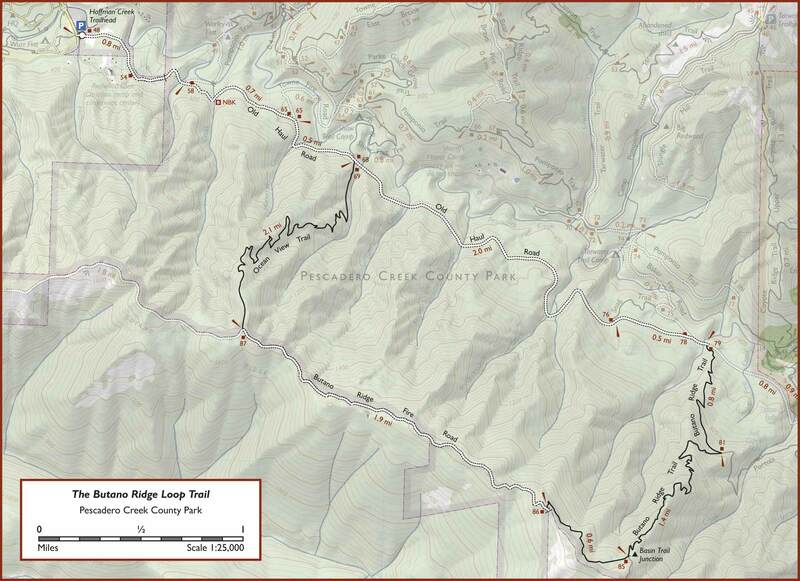 Start on Old Haul Road, which passes through a few fields and then runs through a Christian camp before entering the main body of the park in about a mile. 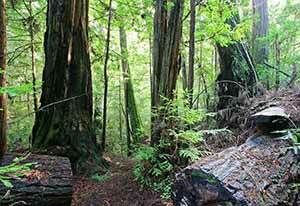 The road passes through a second-growth grove with many huge stumps that must have once been quite impressive trees. One old-growth tree has been left standing by the side of the road. At two miles, turn right onto the Ocean View Trail, which is misleadingly named since the trail itself doesn’t actually have any views. 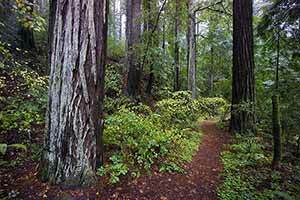 It starts climbing through a shallow canyon with a lush, dark grove of heavily-logged redwoods amid ferns and redwood sorrel. 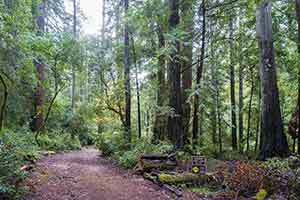 The woods get progressively dryer-looking and more open as the trail climbs, progressing through an area of very small redwoods, then a mixture of tanoak and scattered redwoods, as the ferns and sorrel give way to huckleberry bushes. 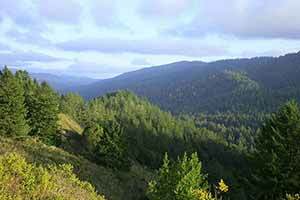 As the trail approaches the ridge, signs of logging become less frequent, the redwoods get a little bigger, and there are even a few small old-growth trees, which have a lighter color, smoother bark, and fewer branches low on the trunk. Although the woods on either side of the road are dense, the extra-wide road feels wonderfully open. There’s a lot of up-and-down on the road that can be tiring. 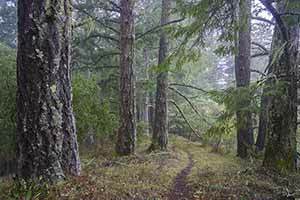 The scenery, which is unremarkable at first, becomes more attractive and varied as the road climbs, passing a few madrone trees and a nice ridgetop grove of grey-barked fir trees. 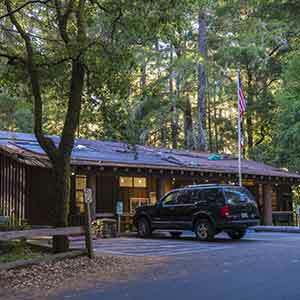 The road is covered with redwood needles, which makes a nice surface for walking. 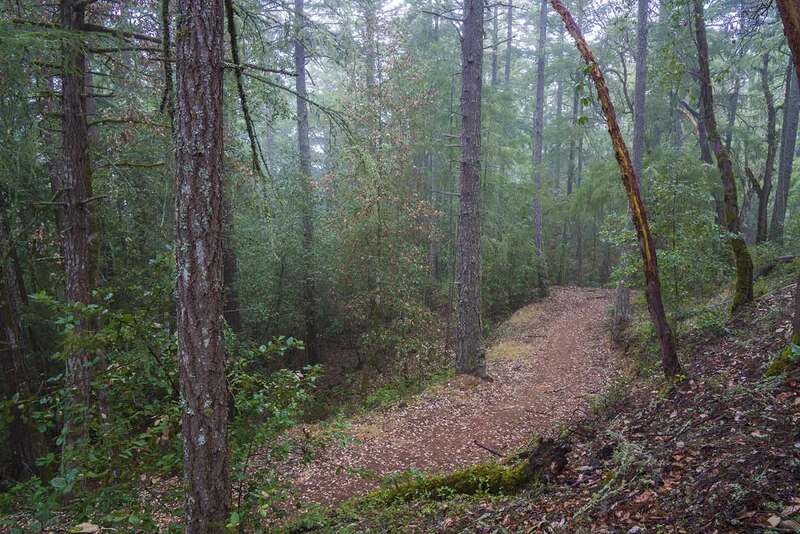 When you reach a gate across the road, turn left onto the singletrack Butano Ridge Trail. The trail runs through more attractive woods and passes a few rock formations. Turn left at the Basin Trail intersection. As the trail descends, it passes through the same succession of environments encountered on the climb. 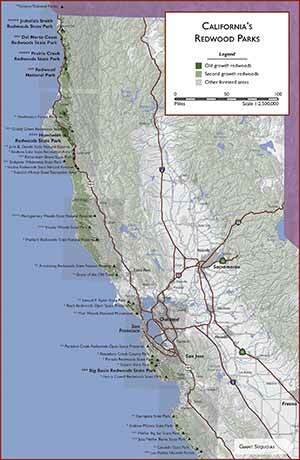 The extra-attractive forest gives way to mundane redwood and tanoak uplands. 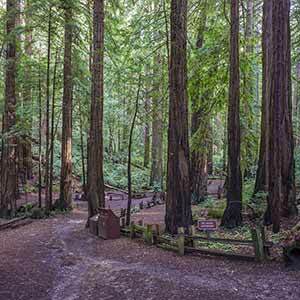 The forest becomes progressively denser and more lush as the trail descends, and as the redwoods become larger and more common, stumps appear and become common. 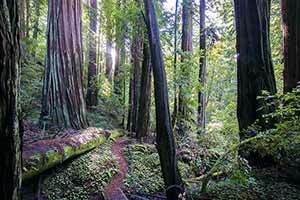 The bottom of the trail passes through a heavily-logged second-growth redwood forest. 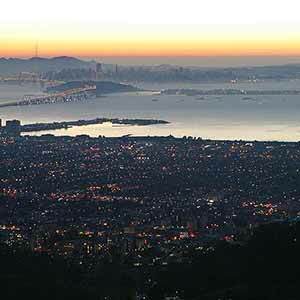 If you have the time and energy for an even longer walk, take the Portola Trail instead of the Butano Ridge Trail. 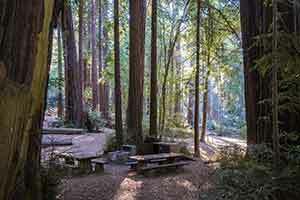 This route adds 1.6 miles to the hike but is slightly more scenic, meandering pleasantly through a redwood-filled valley and passing a tiny waterfall. Old Haul Road is pleasant and relaxing, a peaceful, easy stroll, especially because after the first mile it’s mostly downhill. The woods are second-growth but they’re attractive in their own way, with dark conical trees rising up into the clear blue sky. Typically for a logging road, in some places the woods appear to have grown up after the road was built, so there’s a lot of foliage along the road but not a lot above the road. This tends to give the woods a very clean, sunny look. 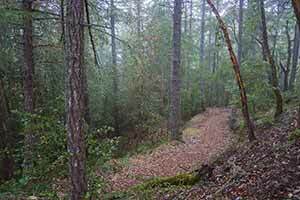 Here are a few more pictures of the Butano Ridge Loop Trail.